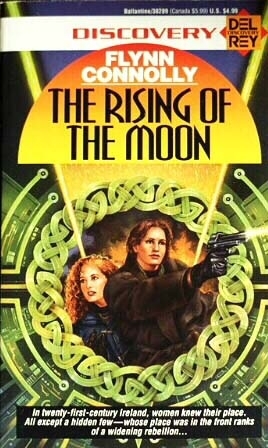 The Rising of the Moon, paperback, published by Del Rey in 1993. Out of print, but available from sellers on Amazon. 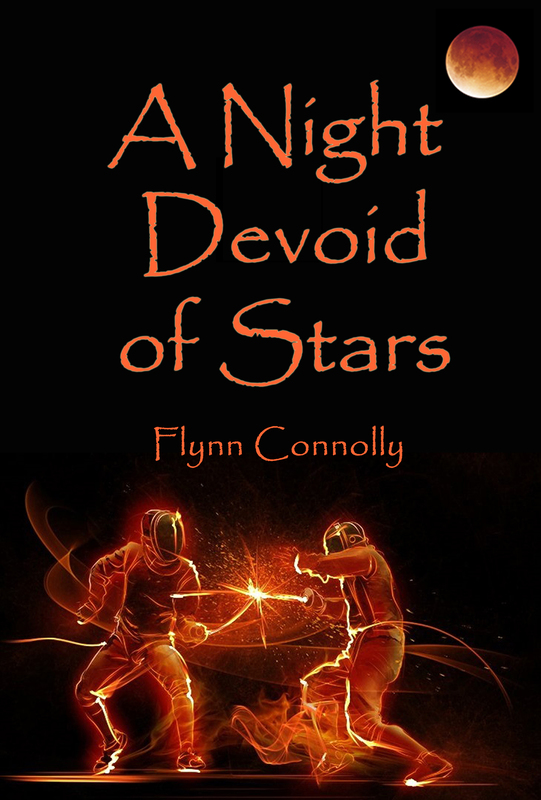 A Night Devoid of Stars, published for Kindle in 2014. Available in e-book form from Amazon for $2.99. It’s been 21 years (!?) since The Rising of the Moon was published by Del Rey in 1993. The book received a few nice reviews, was even nominated for a couple of awards (didn’t win), and sold a few copies (I was working in a bookstore at the time it came out, so I probably sold most of them myself, as Del Rey did no marketing that I’m aware of), and then my publishing “career” sputtered to a stop. I wrote a few more novels over the years, had an agent and then another one, but didn’t sell another book to a publisher. The second agent tried to sell one he claimed to love, but the only six publishers he apparently deals with didn’t want it, so he gave up. The next novel I wrote he didn’t like much, so he dropped me as a client. I was floundering, wondering if writing was only going to be a hobby, trying not to give up hope of succeeding at the only thing I’ve ever really cared about doing—then e-publishing happened. I bought a Nook to see what it was all about, then bought a Kindle because Amazon is the giant in the book-selling industry and I wanted to compare the two. I love both the Nook and the Kindle. I buy way too many books for both (almost never spending more than a few dollars on any book and usually getting them for free), but I rarely have time to read. Life is complicated. Yes, I know, that’s profound. In January of this year, I was laid off from the university where I’ve worked for the last 30 years or so. It was the fourth time I’ve been laid off from the UW, and this time I don’t think I’m going back. The other times, I had few choices. I always seemed to end up working in a library on campus until another editor job came along, then I would get that job because I was on the lay-off list. This time, however, I was already working for myself, doing copyediting for a publisher, and making more money than I ever had at the university. Working more hours, too: There have been advantages (freedom) as well as disadvantages (no time to do anything else when you’re working on deadline, seven days a week). Anyway, I think I’m finally done with the university. Not quite old enough to retire, but old enough to know I’d rather work for myself than to answer to anybody else ever again. So I was busy working too much, trying to learn about self-publishing in my “spare time”—which I never have. 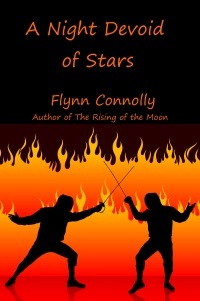 I dug out the old files of the second novel I wrote, A Night Devoid of Stars, and tried to follow the often-conflicting advice I found online and in e-books about how to prepare a manuscript for e-publishing. I worked at it, slowly, making changes, wondering if the thing was good enough to bother with at all. Then, a few weeks after I lost my job, my mother died. Quite unexpectedly. I won’t go into that, but it was nearly a knockout punch. My biggest fan, my best friend, my strongest supporter, the one person who always believed in me—suddenly gone. It’s been seven months, and I’m not over it. I’ll never be over it. Then a few months later, George Donaldson died, also completely unexpectedly. Okay, so I never had the privilege of meeting George, but he meant a lot to me. A lot. I have every Celtic Thunder album and DVD and go to see them in concert every time they come to Seattle. Every Thunderhead knows what a sweet man George was, and gods, could he sing! I think I was in too much shock when my mother died to even cry very much, but when George died too, so soon after . . . Depression can run in families, and there is some connection—I think, though I’m no expert—between depression and creativity. Let’s just say that depression and I have been long-acquainted. Even so, I continued, slowly, to work on Night. I tried to make a cover, which looked kind of cheesy, definitely amateurish, but then, I don’t know a lot about Photoshop so I did the best I could. Then a very nice woman named Laura DiFiore, who had loved Moon and beta-read Night for me, found a wonderful picture online and told me about it. It was perfect. I bought it from the artist so I would have the right to use it for a cover ($75 but well worth it), and a small picture of the moon in the same color, played around with fonts, and came up with a new cover. I’m still no expert in Photoshop or graphic arts at all, but hey, I like it. Laura also gave me a few great ideas for changes to Night, which I worked on. Eventually, I stopped rewriting. (Because you have to at some point: Even though you can always make it better, if you never stop rewriting, it will never be done.) I thought I was almost ready to try to self-publish. I still knew nothing about what comes after—marketing and whatnot. But I was beginning to think I would never publish the thing. So I did it. Too soon? Not enough information? Probably. Almost certainly. But I uploaded it to Amazon. Within hours, there it was: my book, my second novel, published. Then I had to leave town for my mother’s belated memorial service. I was gone about five days, then was swamped with editing work when I returned. I’ve checked online once or twice (or three times) and have seen no reviews at all yet. I don’t know if anyone has even bought the thing. I’m sure there are ways to find out, but I just haven’t had the time to do so. Then Robin Williams died. Damn it—AGAIN?! People I care about need to stop dying. Seriously. How can you drag yourself up out of the pit of despair when the universe keeps knocking you back down there? And the reason he died— I think it was Garry Marshall who said that Robin made the whole world laugh, but he couldn’t make himself happy. That’s about the saddest thing I’ve ever heard. First my mother: The group of people who knew and loved her was perhaps small, but no one loved her more than I did. Then George: At the very least, tens of thousands of people loved George, whether they had met him or not. And Robin: Millions of people loved him, the world over. It feels like the universe has been upping the stakes. STOP IT. NO MORE. I have been so angry lately, with the awful impotence of helplessness. For the past twenty years, I have lived in a mobile home park north of Seattle. I moved there because I’ve never had any money. Writers and editors, for the most part, don’t; a love of words rarely brings with it a bountiful income. Space rent in a mobile home park is much lower than buying a condo or renting an apartment—at least in Puget Sound country, where the cost of living is so painfully high. And I moved there to be rid of the living-in-a-box feeling of apartments, surrounded on all sides by other boxes. Humans aren’t made to live that way, too close to other humans. At least I wasn’t. I really don’t want to hear other people’s televisions, children, arguments, and other, more embarrassing noises. I chose to live apart because humans make me feel claustrophobic. Well, “apart” is relative. The space I’ve been paying almost $500 a month for grants me a few feet on all sides, no adjoining walls, no one above or below me. That small space of freedom has been the only good thing about living in a now-40-year-old mobile home. That, and the trees. This mobile home park has been here for decades. The trees are older than my half century. There are maybe a few dozen scattered throughout the park: big trees, old trees, beautiful trees. They are mostly evergreens (firs, spruce, cedars, etc. ), and in my small space, two birch trees that planted themselves behind my house within the last ten years, two redbuds I planted fifteen years ago, and a Japanese maple I planted at that same time, which is now as tall as my house and a vivid scarlet in the autumn. Those trees, all of them, are home to a myriad of squirrels, Stellar’s Jays, sparrows, wrens, crows, woodpeckers, and who knows how many other kinds of birds. I’ve also seen possums in the immediate vicinity, and I assume there are raccoons, as this is their territory too. The fir a few feet in front of my house is perhaps thirty feet tall, maybe taller. Generations of squirrels and birds have lived in that tree, bothering no one (except my cats, who resent their existence and who twitch and chatter at the sight of them). Sure, evergreens drop needles everywhere, including my roof, but that’s a minor annoyance, easily remedied, and well worth the beauty of the trees, the oxygen they create, the homes they provide small creatures. Every time I have looked out my front window for the past twenty years, I have felt so fortunate that I have a view of trees, and not a parking lot or another building. I’ve always known how lucky I was to live in the company of trees. The mobile home park was recently sold. We have a law here in my town that says that if a mobile home park is sold, it must remain a mobile home park so new owners can’t force us out of our homes in order to “develop” the land. But of course, nothing prevents them from getting creative and making us want to leave. And so it has begun. First came the five-page list of new fascist rules: Children who live here are no longer allowed to ride their bikes in the park. Residents are no longer allowed to stand outside and talk. No one is allowed to walk in the park, except on the shoulder. (We have a shoulder? Who knew?) A maximum of three pots and/or planters are allowed, but no bigger than 18 inches long and to be placed only on the porch, not behind the house or to the side of the house . . . etc., etc., etc. Five pages of this, with state law cited throughout. But wait, there’s more. The mobile home next to me that was abandoned years ago and falling apart was demolished. I wasn’t sorry to see that mess go—until I discovered that two RVs will be parked there. Well, that makes sense. Why collect rent on one mobile home when you can collect rent on two RVs, right? Ah, but not to worry. A privacy screen of some sort of shrubs will be planted down the center of what was once my yard to “protect my view,” while cutting my yard in half. Right where my Japanese maple stands today. Then the PUD showed up to raze the two birches behind my house, ostensibly because they were too tall and too near the power lines. I’m sure it’s just a coincidence that only now did the PUD decide those trees had to go. Then, a week or so later, the buzz of chain saws again swept through the park, bringing more death and destruction. So far about a dozen of the evergreens have been murdered. The reasons given? They’re “dangerous” and “dirty.” No mention of how much money is being made from the lumber. An entire row of evergreens between two of the houses—dead. All the trees in the parking lot—dead. Oh, but not completely gone. Oh no, the stumps are still there. Maybe will always be there. The trees are murdered, but the corpses remain as evidence of the crime. I can only hope the squirrels had time to flee before their homes came crashing down. Birds can at least fly to safety, temporary as it may be. I try not to look now when I walk down to the mailbox (only on the shoulder, of course!). Try not to listen to the lingering, silent screams of the dead. It’s Thanksgiving week so the tree killers are on holiday, resting from their labors. I don’t know how soon they’ll get back to work. How long the majestic fir in front of my house has to live. Will they murder it on a day that I’m home, so I get to listen to it die? Or will it happen while I’m at work, so that I’ll come home to a stump where once a giant stood? There will be no more squirrels or birds to defy my cats. No shade in the summer to cool off the metal box I live in. No transcendent green branches when I open my curtains. I may never open those curtains again. Last week I gave money to the Arbor Foundation. Ten trees will be planted—somewhere. Not here. Not where I live. I can only hope to somehow find the money to move away, away to somewhere else, somewhere with trees. “And Truffula Trees are what everyone needs. What aspiring writer hasn’t heard the adage (or even been solemnly instructed by the teacher of a creative writing class) to “write what you know”? Every time I hear that, I invariably think, “But what if you don’t know anything?” Which then reminds me of what Will Rogers said: “It’s not what he doesn’t know that bothers me; it’s what he knows for sure that just ain’t so.” Which then makes me think of Pat Robertson or Rush Limbaugh or George W. Bush, and then I just get depressed. Or nauseated. Should writers write only about their own personal experiences? I doubt that Agatha Christie ever really murdered anyone (at least I hope not … but then again, that might make a good novel and perhaps already has, for all I know) or Sue Grafton or Nevada Barr or Marcia Muller or Sara Paretsky or for that matter, Sir Arthur Conan Doyle. It’s also unlikely that Ray Bradbury ever visited Mars or Tolkien ever visited Middle Earth. And as far as all the many, many, many novels about plucky young heroines who have vampire/werewolf/werewhatever boyfriends–seriously doubt the authors really do. But if writers were limited to writing only about what they have experienced themselves–the world would be an awfully boring place. Years ago I wanted to write a novel that had some swordfighting in it. Don’t remember now how I got on that kick. Maybe it was watching “Highlander” or “Zorro” or “Scaramouche” or “The Three Musketeers” or “Robin Hood” or “The Court Jester” or “The Princess Bride” or “Star Wars”… come to think of it, there’s an awful lot of swordfighting in the movies, isn’t there? Thoughts on why will have to wait for another day. Anyway, I knew I really wanted some good swordfighting scenes, but I had no idea how to describe it. Watching it doesn’t tell you the terminology, and you can’t really even tell what’s going on just by watching, because it all happens so fast. So I took a beginning fencing class in a salle in Seattle. It was fun, but about the only thing I really learned was that I should have started decades earlier, when my knees were younger. Didn’t help me write about swordfighting. So to the library I went. And the bookstore. I found more about swords and the art of using them than I ever dreamed existed. I read. I took notes. I read some more. And I wrote a novel called A Night Devoid of Stars. The novel isn’t about swordfighting, but those scenes are my favorites. They were fun to write, but I don’t claim that they’re accurate. I mean, I hope they are. But I’m no expert. I did the best I could with what I had to work with at the time, and I loved doing it. Someone else, who, you know, actually knows this stuff could no doubt do it better. So. Write what you know? Absolutely. Or write what you learn. Or better yet, write what you can imagine. Isn’t that what fiction is, after all: an entire universe of the imagination? You can write nonfiction, certainly, if you’re so inclined, but if you’re not, you can always do research and you can also make stuff up. The world is a grim place: We need stories to take our minds off real life. And as Liza Minnelli once said, “Reality is something you rise above.” Fiction can help you do that. If you write what you imagine. I try to live up to that. And I treasure that little red book, my own collection of the wisdom of others who use words better than I do. This is my first blog post. (yay, me!) The whole point of this is: I am going to try to self-publish the novels I’ve written, since I’ve had little luck getting a second novel published by a “real” publisher after my first novel, The Rising of the Moon, was published by Del Rey. Moon was hardly a best-seller, in spite of good reviews and nominations for awards. Consequently, Del Rey had no interest in the sequel. I managed to find an agent, but she wasn’t thrilled with my third novel (A Night Devoid of Stars), and then she disappeared. I wrote a fourth novel (Blood Kin), and found another agent, who loved it. (Really, he did.) He submitted it to the only publishers he apparently deals with, all of whom rejected it. (Sigh) He had absolutely no advice on what I should do next with Kin, so time passed, and I wrote another novel (The Curse of Macha). My agent wasn’t as fond of that one: He thought there weren’t enough straight, young men in it (I kid you not! ), and he basically dumped me. Since then I’ve been wondering what to do with these already-written novels. Forget them? After all that work? Yes, I loved writing them, but as much fun as writing is, it is still work, after all: my heart and soul and blood on the page. Then I bought a Nook tablet and discovered e-books. I love my Nook: so easy on the eyes and so many books, only a click away! So now I’m researching how to self-publish e-books. I figure, what have I got to lose? If publishers aren’t interested in me or my novels, why not become my own publisher? Apparently, if you want to self-publish, you have to first have these things called “homepages” on the Interwebs, and tweety things, and Facewhatevers. Who knew? So this is me, wading in, wondering if anyone, anywhere, will even notice. First, I create a blog (this is it! ), and a website (this is it? ), then figure out what to do on/with Facebook, and what to do with Twitter (besides just following Celtic Thunder and Nancy Lee Grahn). Assuming I figure all that out, I’m hoping to self-publish A Night Devoid of Stars. Don’t know how long it will take to get that far. But that’s my plan. So stay tuned–assuming anybody’s out there. Hello? Is this thing on?